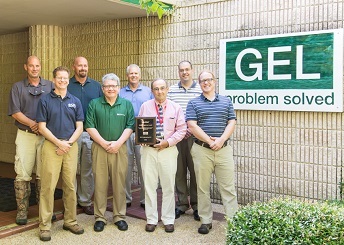 GEL Engineering, LLC is pleased to announce the firm was presented with the Safety Vigilance Award by Consulting Safety Managers, Inc.
GEL Engineering recently reached a new safety benchmark – surpassing five consecutive years without an OSHA recordable injury. Over the past five years, GEL Engineering employees have worked over 500,000 hours and 1.3 million work tasks without a recordable injury. “This award and milestone is a testament to GEL employees’ commitment to safety every day. As an integral part GEL’s core values, the safety of our employees, clients, and the community is our number one concern,” said Joe Coffey, Jr., P.E., GEL Engineering’s Director. In addition to the safety commitment and focus of its employees, GEL cites its Safety Excellence Team and the firm’s ongoing safety initiatives and training programs and process in contributing to this safety milestone. With offices in Charleston and Greenville, South Carolina, and Durham, North Carolina, GEL Engineering provides comprehensive environmental, engineering, surveying, and industrial hygiene and stack testing services to local, state, and federal agencies, as well as manufacturers, property owners, developers, and a wide range of commercial clients. The company is a member of The GEL Group, Inc. headquartered in Charleston, South Carolina, since 1981. For more information, visit gel.com.